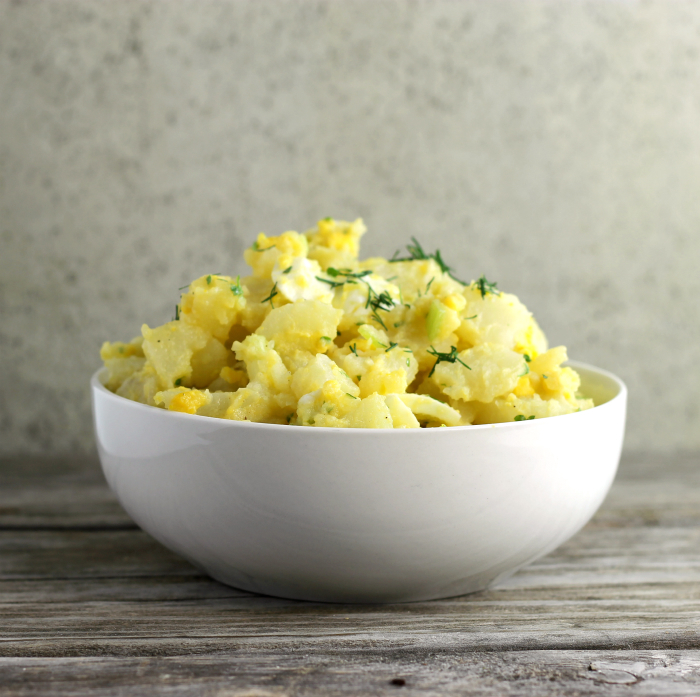 No-mayo potato salad - not your everyday potato salad. No-mayo potato salad is a new favorite of mine this summer. 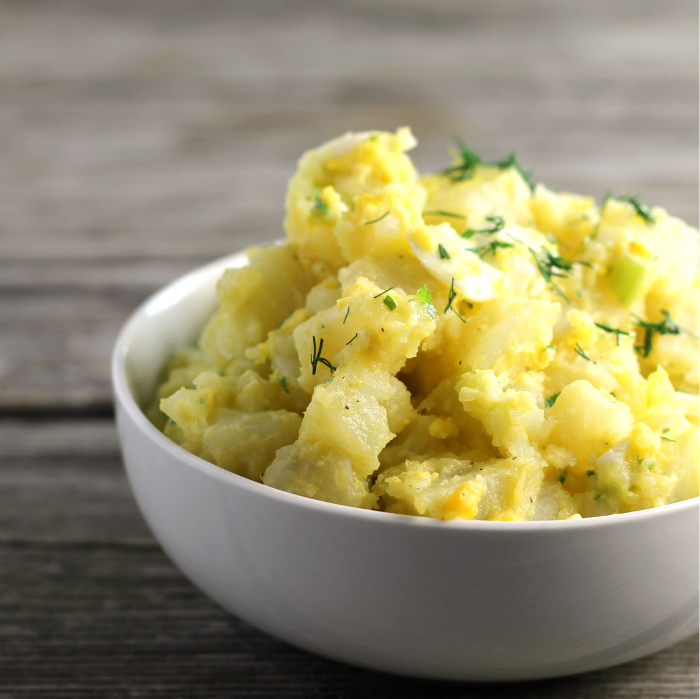 Potato salad has always been one of my favorite sides in the summertime. I have eaten creamy potato salad my whole life. My whole life I have eaten creamy potato salad. 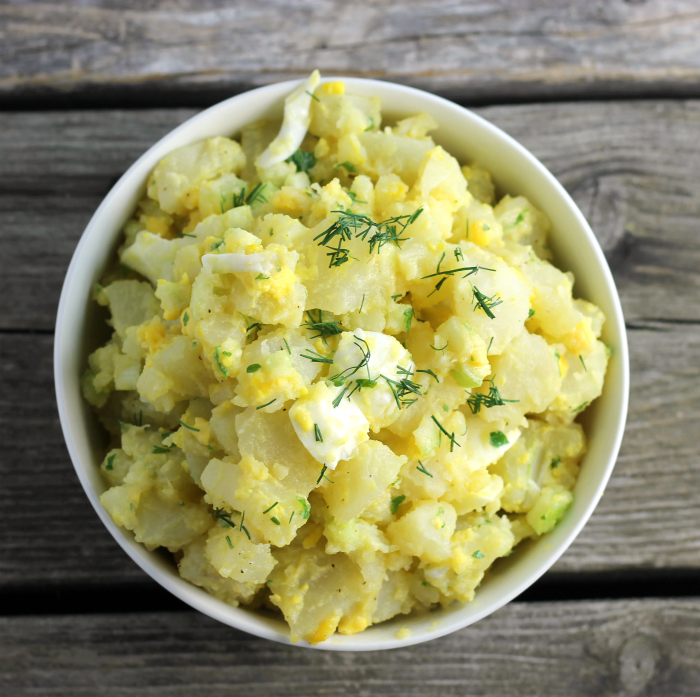 Oh, my mom makes a great German potato salad, but otherwise, it has been creamy the whole way. Here is the story behind the no-mayo potato salad. I was asked to bring a side dish for an employee lunch earlier this summer. Well, let me tell you I work with people that have food allergies and then there are other people that don’t eat this and other people that don’t eat that. Let me tell you bringing a dish to work to pass is not an easy task. So I put on my thinking cap and decided to make a no-mayo potato salad. Now really who doesn’t like potato salad, right? I noticed a few people that didn’t try the potato salad, but the people that did try the salad took seconds. One of my co-workers asked for the recipe. Absolutely the best compliment a cook can recipe. For this no-mayo potato salad, I went with an oil and vinegar base. Totally different flavor than your creamy potato salad, but I have to say that I really love the flavor. I really love eggs in a potato salad, so yes there are eggs in this potato salad. If you don’t like eggs I am sure that this potato salad would still be lovely, but I highly suggest adding the eggs. I have made this no-mayo potato salad for my family and some of them like it, while others didn’t even try. This is because I have some kids that like creamy potato salad and kids that won’t eat potato salad. The ones that like the creamy potato salad would not try the new potato salad, but the one that won’t eat the creamy potato salad loved the no- mayo potato salad. Where did I get these kids? I do have to say that Mike and I love the discovery of the no-mayo potato salad. Cut the cooked potatoes and the hard-boiled eggs into cubes. Add the celery and onion and toss together with the potatoes and eggs. In a food processor (I used a mini food processor) add the olive oil, red wine vinegar, Dijon mustard, and fresh parsley. Add about half of the dressing over the potato mixture and toss. Add the remaining dressing and toss the potato mixture until it coats the salad. I prefer mayo free salads..this looks light yet flavourful and delicious, Dawn. I totally agree…someone asking you for a recipe is the highest compliment ever! 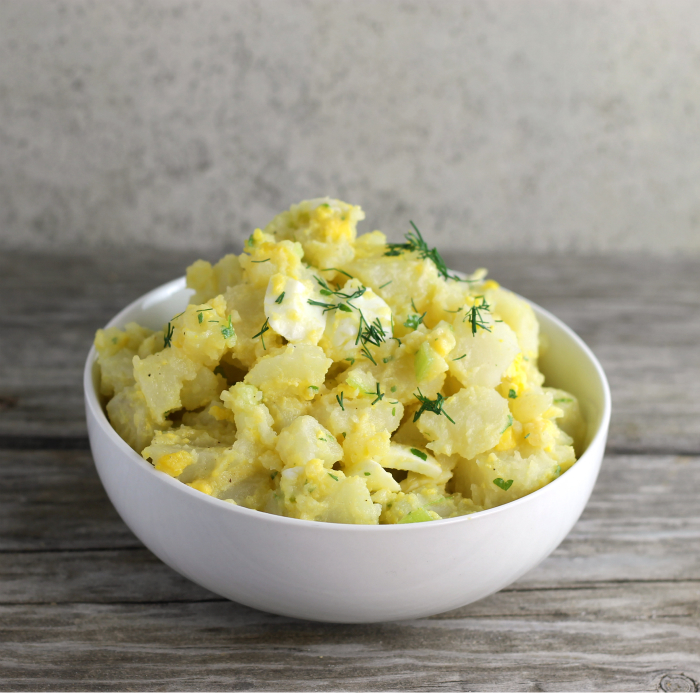 Sounds like your work lunch was a success…if for no other reason than you now have an awesome potato salad recipe in your back pocket! Sounds perfect for summer picnics! I love the idea of no mayonnaise in potato salad…and I am loving the dressing…looks delicious and yes, I like hard boil eggs in mine too. I like mayo-based potato salads, but given my druthers I’ll almost always take a vinegar and oil one. This looks wonderful! Thanks so much. I have made oil and vinegar based potato salads before but this versions looks particularly good. It is going on my to try list!